Just over five years ago, Pathway to change: evolving Defence culture, a five-year plan highlighting areas requiring cultural change within Defence, was released. This strategy aimed to address cultural issues that had been recognised as needing reform; notably, one area was the inclusion of women in the ADF. With the five-year implementation timeframe having concluded in April, it’s important that we reflect on what progress has been made and ask ‘Where to next?’. The Pathway to change plan was led by the Department of Defence and was an analysis of its own cultural strengths and areas for improvement. Part of this involved looking at the attitudes and treatment of women in Defence (both in the APS and in the forces) and how to improve the future recruitment, retention and inclusion of women in decision-making bodies within the organisation. Pathways to change found that ‘noticeable gaps remain in the representation of women across senior leadership positions’ and made a commitment ‘to address the inclusion of women in decision-making bodies’. Five years later, we can see that some progress has been made. Defence’s Head People Capability, Rear Admiral Brett Wolski, recently confirmed to the Joint Standing Committee on Foreign Affairs, Defence and Trade  (JSCFDT) that ‘there are 70 senior offices that are female, which is growing slowly. Over the last 12 months, we have increased that number by between five and 10.’ A quick search through Defence’s own website  reveals that, of its own ‘senior leaders’ in service and APS roles, there’s one female in the group of 16. Further, the Women in the ADF annual report 2015–16  indicates that the number of women in key Defence decision-making bodies increased by only three in the past three years. These numbers make the case that, while some progress has been made, more still needs to be done to ensure that women are adequately represented in senior positions and appointed to decision-making bodies. Of course, boosting the overall number of women within Defence is critical to ensuring that we get the next generation of women leaders coming through the pipeline. Recent figures on the female participation rate in the ADF have risen to 16.1%, up from 15.4% in 2015. The Navy has increased from 18.9% to 19.7%, the Army from 12% to 12.6% and the Air Force from 18.8% to 19.9%. It’s critical that work continues on building these numbers and retaining women so they can progress through the ranks to senior roles. Addressing structural barriers for women within the ADF is critical to improving retention and increasing the number of women in senior roles, and that includes exploring flexible working arrangements. Vice Admiral Tim Barrett acknowledged the barriers during the JSCFDT, including ‘issues around the ability to manage life balance with what we demand in activities. That is where a lot of work is being done to look at flexible workplace arrangements. It will be a continual challenge for us.’ Addressing issues such as flexible working arrangements is important to retaining women in the ADF and ensuring that there are women who are available to fill senior roles. In line with the aim set out in Pathway to change is the progress that has been made on the removal of gender restrictions on the remaining ADF combat role employment categories from which women were previously excluded. This has been a significant achievement for the ADF. This plan, first introduced in 2011, has since come to fruition—an acknowledgment that no door will be closed to those women who can meet the challenge. We have learned that, while these numbers are small, they are gradually growing. For the first time, women are now training to become clearance divers and fast jet pilots—roles that were once open only to men. Continuing and increasing momentum to recruit, retain and include women in all areas of defence is about much more than promoting equity in our defence forces: it is critical to our capability. The 2016 Defence White Paper  acknowledged both the underrepresentation of women and the importance of the skills and capabilities that they have to offer. We know that diversity on corporate boards has proven to lend itself to better decision-making, and it’s no different in Defence. Women in Defence are already playing an essential role by providing a gender perspective that helps to improve the planning and execution of ADF operations. This is especially the case for our operations in Afghanistan, where working with local women on the ground was critical to the ADF being able to operate effectively, or in the ADF’s response to tropical cyclone Winston in Fiji, where local disaster relief focused on women and children who were particularly vulnerable. 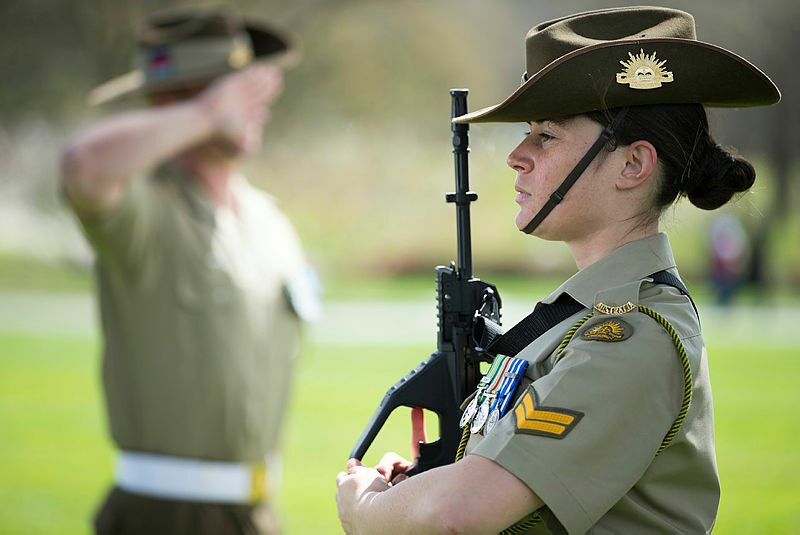 While evidence suggests that participation and roles for women in the ADF are slowly increasing, including now in combat roles, the Pathway to change five-year time frame is coming to an end, but the momentum and effort should not. There’s a need for the government to maintain the momentum, provide a vision for what’s next for women in the ADF, and show how we can continue to attract and retain women in Defence. This is critical to our defence capability into the future. Amanda Rishworth is Shadow Minister for Defence Personnel and Shadow Minister for Veterans’ Affairs. Image courtesy of the Department of Defence.